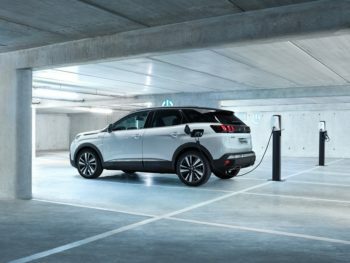 Peugeot is to launch high-performance plug-in hybrid versions of the 3008 SUV, and the new 508 and 508 SW this autumn, offering CO2 emissions of 49g/km and up to 30 miles of electric range. Peugeot will offer two plug-in hybrid systems in the 3008 SUV. There are two slightly different versions of Peugeot’s new hybrid system. The 508 fastback and 508 SW estate get the ‘Hybrid’ version, which pairs a 178bhp petrol engine and 109bp motor to produce 221hp. They feature an 11.8kWh battery, offering up to 30 miles of electric range and CO2 emissions of 49g/km, Peugeot said. The 3008 SUV launches with the more powerful ‘Hybrid4’ system, reviving a name last used for PSA’s diesel-hybrid setup. This features a 197bhp petrol engine, and 109bhp electric motors at the front and rear axles, producing a combined 296bhp and reaching 62mph in 6.5 seconds from rest, making this the fastest model in the range. Hybrid4 versions feature a slightly larger battery, at 13.2kWh, maintaining the 30 miles of range, and add an all-wheel drive mode to the electric, Sport, Comfort and Hybrid settings offered in the 508 Hybrid. Peugeot will offer the two-wheel drive plug-in hybrid system in the 3008 a few months after launching its flagship version – the Hybrid4 is only available in range-topping GT trim. Peugeot’s hybrids offer charging at 32 amps/7.2kW, taking two hours to fully charge. The port is on the left-hand rear wing of the cars, meaning (unusually) that they can be reversed into parking spaces to be plugged in. Drivers can opt to save the electric range for later parts of the journey. The 3008 and 508 plug-in hybrids launch this autumn. These are four of the eight plug-in hybrids planned by PSA Group over the next two years, alongside the DS 7 Crossback (which uses the four-wheel drive setup), and the Citroën C5 Aircross, and Vauxhall and Opel versions of the Grandland X (likely to be two-wheel drive).